Look no further for the Best Turkey Marinade recipe ever! 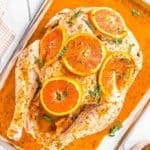 This BEST Citrus-Chipotle Turkey Marinade not only keeps your turkey moist but incredibly flavorful. Simple to prepare, and totally delicious. Place the turkey, neck first, in a large plastic bag. Add water, apple cider, salt and sugar. Close the bag, pressing out as much air as possible, and shake it to mix the ingredients and dissolve the salt and sugar. Brine the turkey in the refrigerator for 24 hours. Remove turkey from the brine. Dry it with paper towels and place it on a large plastic bag, or a large baking sheet. In a blender, combine garlic, vegetable oil, orange juice, apple cider vinegar, kosher salt, lemon juice, oregano, cumin, coriander, onion, chipotle and yellow pepper paste. Process until everything is well blended. Pour marinade inside and out the turkey. Add the orange slices inside the bag, or over the turkey if you’re using a baking sheet, and sprinkle with sage. Cover very well and refrigerate overnight or up to 24 hours. The next day remove the turkey from the marinade and bake according to the size of the turkey. Can I use the marinade to baste the turkey? After raw turkey, or chicken, has marinated in any kind of liquid, that liquid is as unsafe to consume as raw meat is. However, you can baste the turkey/chicken with the marinade from the very beginning of the cooking process, because the marinade will get cooked through along with the turkey and the cooking process will destroy any harmful bacteria. To use the marinade later in the cooking process or as a sauce, you must boil it vigorously for at least 5 full minutes. Then use a CLEAN basting spoon or brush to apply it to the chicken. If you don't feel safe using the marinade you can also remove 1/4 cup of marinade prior to pouring over the raw meat and reserve for later use. Looking for more recipes ideas for Thanksgiving?